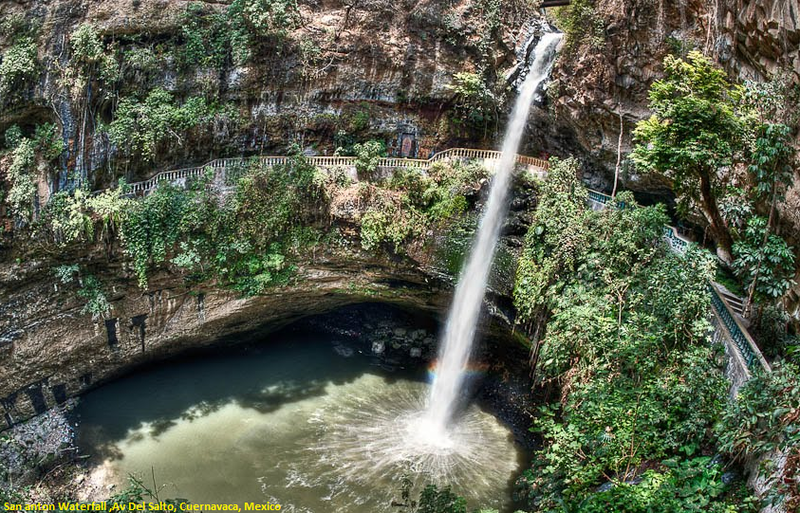 In the village of San Antonio Analco is this waterfall that has a drop of 40 meters in the middle of thick vegetation where you can descend 100 meters through a staircase until you reach the viewpoint where you will enjoy an incredible natural spectacle. As you descend the stairway, you will see the basalt prisms formed hundreds of years ago on the walls. It is one of the tourist attractions in Cuernavaca. A drop of about 100 meters down to staircase leads to a viewpoint where you can enjoy the waterfall that plunges to the bottom of the ravine by a vertical fall. San Anton is one of the eleven villages that make up the city of Cuernavaca. It was founded on May 23, 1487. It is distinguished by its variety of pots, ornamental plants and pottery that you can buy at affordable prices, plus the number of nurseries that offer a variety of beautiful specimens of flora. Visit of the waterfall every day from 11:00 to 18:00.